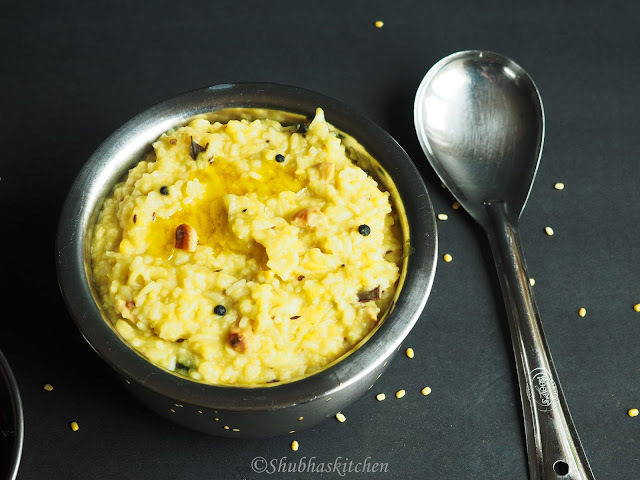 I call this dish, a South Indian khichdi:) Preparing this dish is quick process. Pressure cook the rice-lentil mixture. Prepare the tempering. 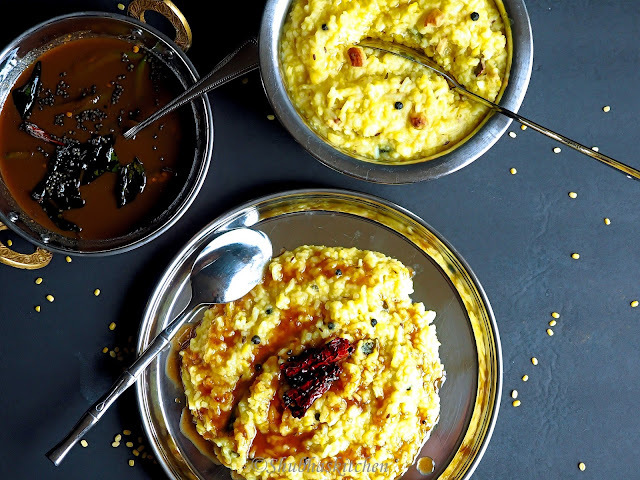 Add the rice to the tempering.. voila...Khara pongal is ready. 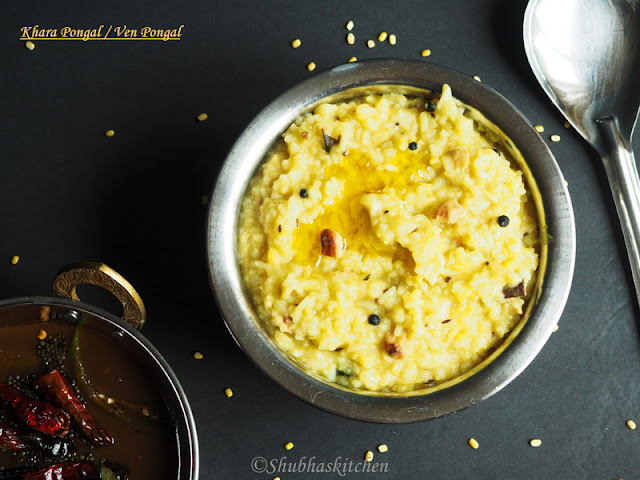 Khara Pongal can be served for breakfast or lunch or dinner. Remember to use only ghee for the tempering . Using oil or any other substitutes will spoil the taste of this delicious rice dish. I have used whole peppercorn in this recipe. If you wish, you can use crushed black pepper. I have used green chillies for some added spice but if you like it simple and mild, you can very well reduce or event omit the green chillies. Add 4 cups of of water and turmeric powder to the rice and moong dal. Pressure cook them. 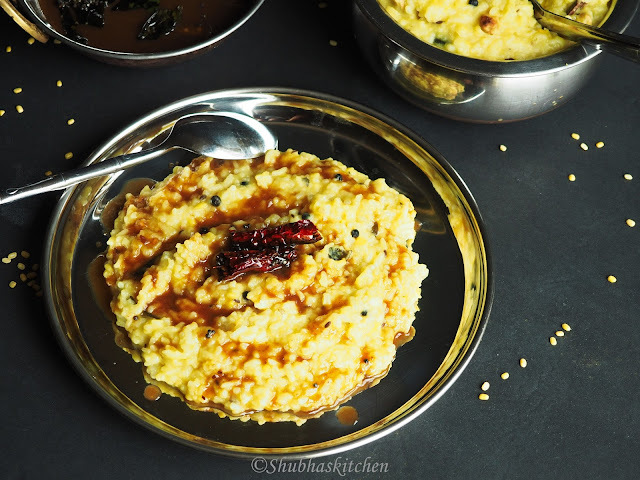 In a deep bottomed pan, heat the ghee /clarified butter.When hot, fry the cashew nuts.Add the cumin seeds, black pepper corns, ginger, green chillies and curry leaves. When the seeds start to splutter, add the rice - lentil mixture.Add some water to adjust the consistency. Add salt to taste. Bring it to a boil and simmer for 5-7 minutes. One of our favourites at home....looks so delicious!! Ghee and spices? I am wobbling here. Pongal look gorgeous like a beautiful sunshine! I agree with you, this is soul food at its best! I can just imagine how tasty this must be, Shubha, and also, how comforting this is to have on a cold day or if you're under the weather.